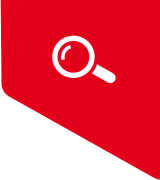 The content of this site is intended for health care professionals only. 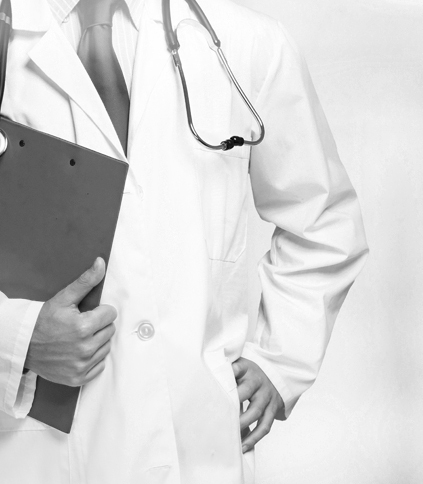 A health care professional is a person authorised to prescribe and dispense human medical products (a physician, a pharmacist). By ticking the box >I hereby confirm that I am a health care professional< you have confirmed to be a health care professional and you have understood the definition of a health care professional according to applicable legal regulations. By clicking „Enter“ you acknowledge that the information on the following pages is intended exclusively for health care professionals and not for lay public, with all risks and consequences arising therefrom for lay public. These risks may result in misinterpretation, misjudgement of your own health condition or incorrect preference of a human medical product. You also acknowledge that you and your doctor decide together whether the treatment with a human medical product subject to prescription is appropriate for you and you should always consult your doctor or pharmacist whether the treatment with a human medical product subject to prescription is appropriate for you. One ml contains 100 mg of normal human immunoglobulin obtained from human plasma pools (*donors from the Slovak Republic). It is indicated as substitution therapy in adults, children and adolescents (2-18 years of age): Primary immunodeficiency syndrome with reduced antibody production. Hypogammaglobulinaemia and recurrent bacterial infections in patients with chronic lymphocytic leukaemia who have previously failed prophylactic antibiotic therapy. Hypogamaglobulinaemia and recurrent bacterial infections in patients with multiple myeloma who have failed to respond to pneumococcal immunisation. Hypogammaglobulinaemia in HSCT patients (hematopoietic stem cell transplantation). Congenital AIDS with recurrent bacterial infections. Immunomodulation in adults, children and adolescents (2-18 years): Idiopatic thrombocytopenic purpura (ITP) in patients at high risk of bleeding or prior to surgery to correct the platelet count. Guillain-Barré syndrome. Kawasaki disease. Flebogamma DIF is a solution for infusion (dripping into vein). It contains an active substance human normal immunoglobulin (*prepared from plasma (the liquid part of blood) from Slovak donors). 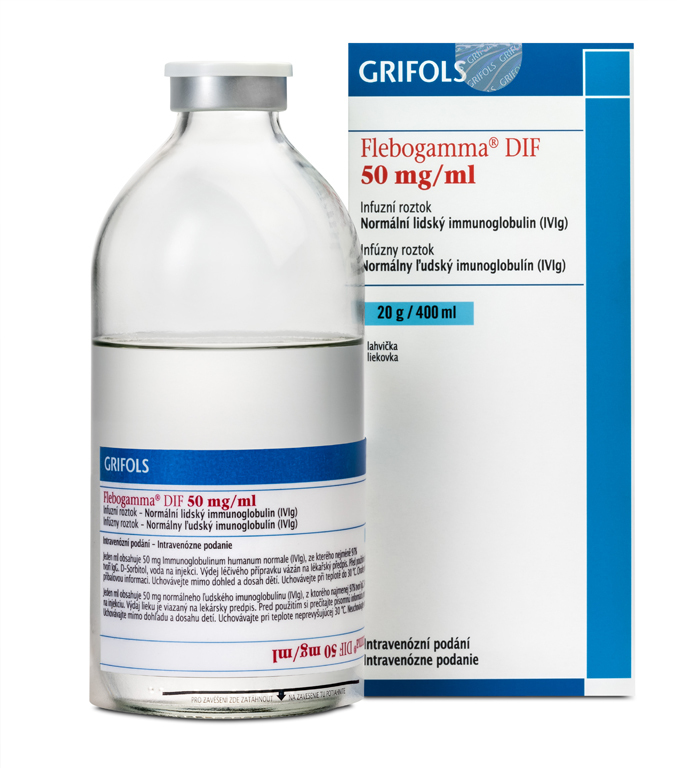 Flebogamma DIF is indicated for the treatment of patients who need to increase their blood antibody level to fight infections and other diseases. One ml contains 50 mg of normal human immunoglobulin obtained from human plasma pools (*donors from the Slovak Republic). It is indicated as substitution therapy in adults, children and adolescents (2-18 years of age): Primary immunodeficiency syndrome with reduced antibody production. Hypogammaglobulinaemia and recurrent bacterial infections in patients with chronic lymphocytic leukaemia who have previously failed prophylactic antibiotic therapy. Hypogamaglobulinaemia and recurrent bacterial infections in patients with multiple myeloma who have failed to respond to pneumococcal immunisation. Hypogammaglobulinaemia in HSCT patients (hematopoietic stem cell transplantation). Congenital AIDS with recurrent bacterial infections. Immunomodulation in adults, children and adolescents (2-18 years): Idiopatic thrombocytopenic purpura (ITP) in patients at high risk of bleeding or prior to surgery to correct the platelet count. Guillain-Barré syndrome. Kawasaki disease. 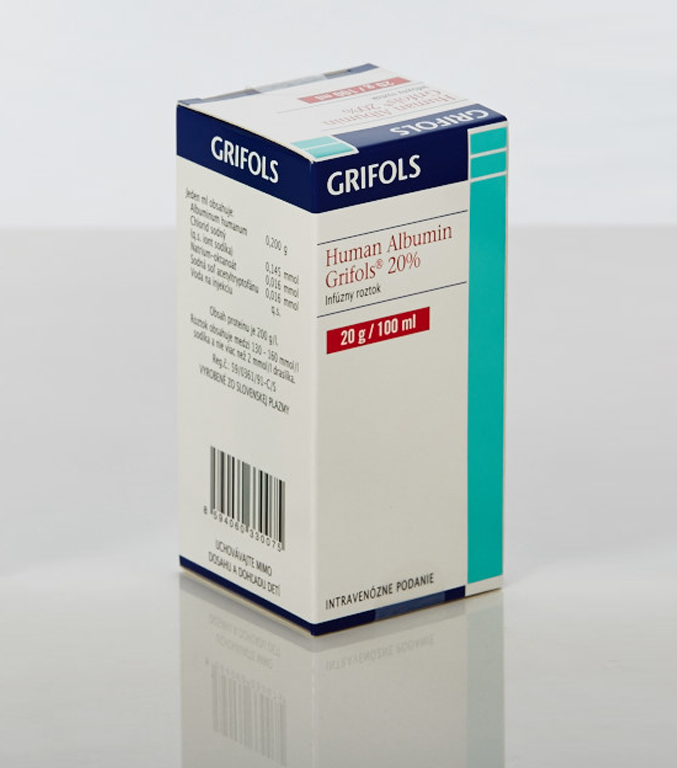 Human Albumin Grifols 20% is a solution that contains 200 g/l of protein of which at least 95% is human albumin (*donors from the Slovak Republic). It is indicated for the restoration and maintainance of circulating blood volume where volume deficiency has been demonstrated and the use of colloid is appropriate. The choice of albumin rather than an artificial colloid will depend on the clinical situation of the individual patient, based on official recommendation. Blood substitutes, plasma proteins, albumin. 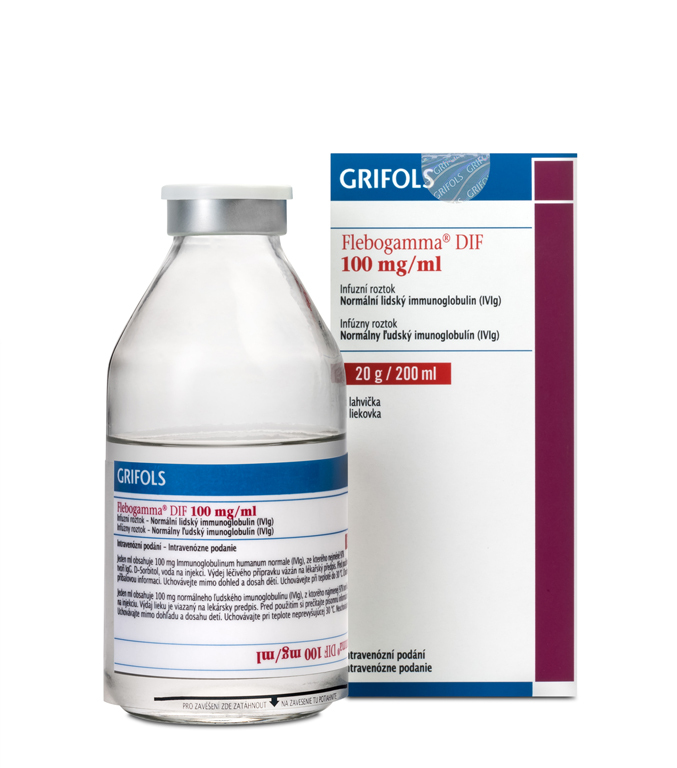 Human Albumin Grifols 20% is a solution for intravenous administration. The solution contains proteins isolated from human blood plasma (the liquid part of blood). The content of plasma proteins is 200 g per 1 litre in each vial of which at least 95% is human albumin.  This product belongs to the group of medicines called blood substitutes and plasma protein fractions. Human Albumin Grifols 5% is a solution that contains 50 g/l of protein of which at least 95% is human albumin (*donors from the Slovak Republic). It is indicated for the restoration and maintainance of circulating blood volume where volume deficiency has been demonstrated and the use of colloid is appropriate. The choice of albumin rather than an artificial colloid will depend on the clinical situation of the individual patient, based on official recommendation. 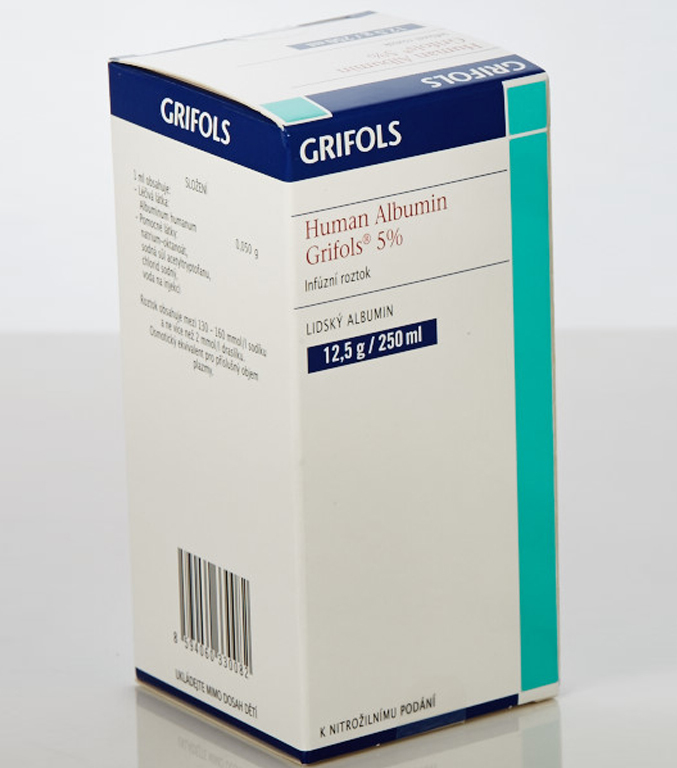 Human Albumin Grifols 5% is a solution for intravenous administration. The solution contains proteins isolated from human blood plasma (the liquid part of blood). The content of plasma proteins is 50 g per 1 litre in each vial of which at least 95% is human albumin. Fanhdi® is a complex of human coagulation factor VIII and von Willebrand factor (*donors from the Slovak Republic). Fanhdi is indicated for the treatment and prophylaxis of bleeding in patients with haemophilia A (congenital factor VIII deficiency), for the prevention and treatment of bleeding in patients with von Willebrand disease (VWD) if treatment with desmopressin (DDAVP) is insufficient or contraindicated. This drug can be used for the treatment of acquired factor VIII deficiency. Antihaemorrhagic agent: blood coagulation factor VIII: von Willebrand factor and blood coagulation factor VIII in combination. Fanhdi® is a complex of human coagulation factor VIII and von Willebrand factor (*donors from the Slovak Republic). Fanhdi is indicated for the treatment and prophylaxis of bleeding in patients with haemophilia A (congenital factor VIII deficiency). Fanhdi is indicated for the treatment and prevention of bleeding in patients with von Willebrand disease (VWD), if treatment with desmopressin (DDAVP) is insufficient or contraindicated. This drug can be used for the treatment of acquired factor VIII deficiency.